Over the years we have refined our working process to ensure that there is as much structure and clarity as possible during a development. This means that questions are answered up front and the risk of any surprises further down the development time schedule are minimised. The exact process and strategy varies depending on your requirements. For instance if you want a website we would follow the process on this page, but it would differ accordingly if it was for a mobile application build or a photography session. Taking place with the key stakeholders this meeting looks to ensure everyone's expectations are set correctly, that everyone is clear on what they are responsible for and to establish the key points of contact for the duration of the project. It will also be important to clarify any deadlines and key dates that need to be considered such that they may be worked into the schedule. The core features of the site will be detailed out in terms of their outputs / end result. From these a technical specification will be created in the planning phase. Core functions will include, but are not limited to, administration processes and end user features (e.g. forums and document download tracking etc). As part of this phase any potential future changes or risks will be investigated and mitigated. This ensures that the future scope of the site is taken into account and all parties are clear on any risks that may be involved. All potential platforms, systems and technology routes will be investigated with a view to establishing the best fit for the requirements and key features that have been identified. Eko UK is familiar with a number of suitable platforms including WordPress, Drupal and Joomla. Should the desired functionality of the site be more complex than is suitable for these platforms Eko is able to create a bespoke content management system to meet exact requirements. Establishing a set of success criteria will be critical to the project. These will be defined at this stage alongside banner and button “calls to action” which aim to encourage users to engage and perform actions on the site. A proposal will be written as a result of establishing the above details. A round of feedback and changes will take place to finalise any remaining aspects before detailed planning commences. A functional specification will be put together to establish core technical components of the project. Specific process details and flows will be evaluated and matched against system requirements. CMS platform requirements and expected site usage will be evaluated to determine the most appropriate hardware required. Eko UK utilises hosting services with 3 leading data centres (Amazon, RapidSwitch and TSO Host). All hosting specifications conform to industry standards including bank grade SSL security, daily backups and redundant hardware. Options for hosting will be detailed at this stage. To ensure the content structure is well established a sitemap will be created. This will start life as a flow chart but may evolve into a ‘paper sitemap’ if required. This enables a soft run through of the site structure and pages to ensure everyone is happy with content and position. There are likely to be instances where a single item of content is accessible from multiple directions / paths. These will be illustrated too. By separating this process away from art direction and graphics we ensure that key stakeholders are not caught up in “what shade of blue” or “what kind of image” should be used, instead keeping focus on the end goals and ensure key objectives are fulfilled. Identify elements of content, photographs, video and text to be secured for the final build. Sufficient time should be allowed to determine the ideal process for content submission from each of the stakeholders. Time can be budgeted for Eko's in-house professional copywriting service to ensure key messages and verbiage are appropriate. 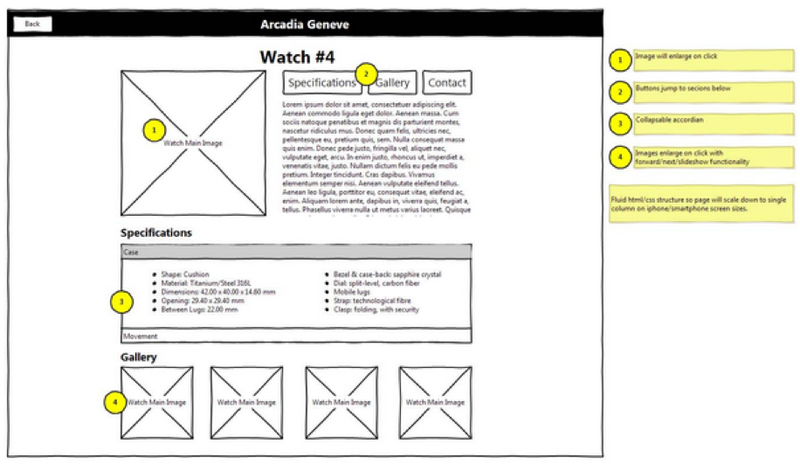 Once wireframes have been established, the look and feel can then be applied against artwork concepts. Typically two rounds of revisions are required and costed however should more time be needed for this process then this can be reviewed. Any required photography will be sourced or created as required to back up the art direction and graphic design. It is strongly felt that short (1-2 minute) videos are key to engaging visitors and communicating desired messages. A home page video and up to 4 other relevant short clips to highlight desired key areas is often suggested (where applicable). Videos provide visitors with context, messages are easily absorbed and encourage the viewer to further explore the site. With a busy Internet and diminishing attention spans, videos are proven to be the most engaging communication method. Having rich media only goes to support and promote your message in the best possible light. Eko can schedule time for professional in-house video production to ensure a consistent theme and style. If the you already own suitable media, then this stage will discuss how they may be incorporated into the project. A keyword research exercise should be conducted to help identify appropriate search terms that the site would wish to rank for on search engine results. It is important that these are incorporated from the outset and the sites pages are focussed to improve ranking. This should be given ongoing consideration, ensuring desired visitors are able to find the site is imperative to its success. This overview process looks to finalise and sign off on all the above stages before moving on to the design and development phase of the project. A development staging site would first be created for design and testing. The preferred live hosting instance would then be deployed prior to launch. The systems, frameworks, databases and environments are installed and work begins on building out the core functionality based on the previously established specification. All Eko UK code is written with in-line comments to assist future updates and debugging. Software Version Control is also used to store code versions and allow multiple developers to collaborate on the project simultaneously. For the front end of the site coding begins with turning the art direction and site designs into coded templates using XHTML and CSS standards compliant code which meets industry standards. As part of the development of the templates, the code / designs will be tested in IE7 +, Firefox (latest build), Google Chrome (Latest Build) and on iPad devices. If other specific platforms need to be taken into account then they will be discussed and established during the planning phase. It is anticipated that some businesses will require conformance to AA standard accessibility guidelines. Eko UK is familiar with the W3C standards and encourages its developers to follow best practice when coding pages. As part of development ‘live’ content will be used to flesh out the system and test the processes for adding the content. After this, the remainder of the content will look to be implemented. It will be established during the planning phase who is responsible for what content population and any training that might be required to facilitate this. It is often proposed to create a 2-part user guide to cater for different types of learners. Primarily a traditional text based ‘help’ section providing tips for each task. Supporting the text Eko UK will provide a series of video walkthroughs for common tasks which may be accessed from the help pages. A review milestone takes place to sign off on the work so far and ensure everyone feels the site is on track and in-line with the success criteria / established plan. Once the site has been deemed suitable for beta release with most functionality working, a beta release will enable selected individuals access to the site and provide feedback. Internal testing will be conducted and all issues logged to the project management system. Throughout development our system enables developers, project managers and third party consultants to monitor progress and ensure milestone deadlines are met. Bugs are recorded, prioritised and assigned to relevant developers. 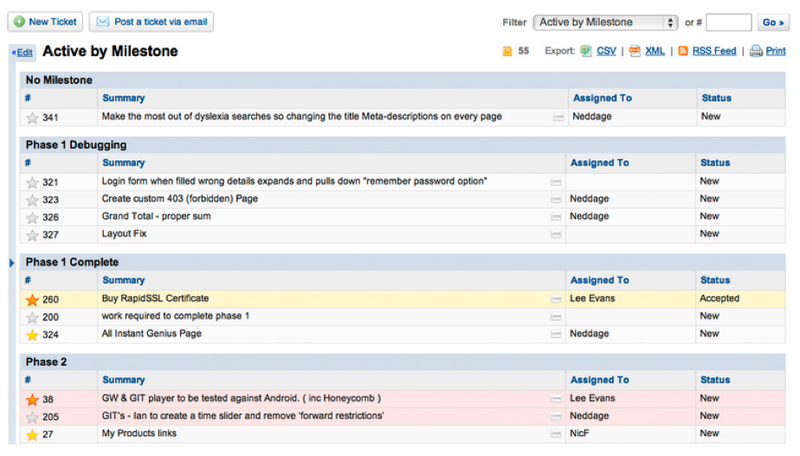 A screen shot below provides an example of a typical projects milestones and tasks. Time may be budgeted for face to face training if required. This may be conducted one on one or in group sessions depending on the number of users. A suitable training room is available at Eko UK’s Shoreham office or the sessions may be run on-site with users. It is worth noting that Eko UK frequently conducts training sessions over the Internet using remote screen sharing software. This can be an effective method for training and support as the user receives direct coaching on their own PC. With bugs resolved, the site may be launched to all stakeholders for review. Although the site should reflect accurately the initial design, there may inevitably be tweaks and refinements. Eko Uk always aims to accommodate those requirements where they are not significant deviations from previously agreed and signed off designs etc. The big day arrives and the site is ready for formal launch. Documentation and final contract sign off should bring a smile to all involved. Once made live the site will be submitted to search engines such as Google, Bing, and Yahoo. Google Analytics will be added to provide both real time monitoring and historic traffic reports. Alternative statistical software packages may be deployed if required. Goals will be defined to measure the effectiveness of each call to action and search terms used. Detailed reports will be scheduled and automatically emailed to the relevant personnel. Access will be given to the Eko UK help desk (http://support.ekouk.com) which provides a portal for tracking support requests. The system allows monitoring of response times and conformance to Service Level Agreements. Tickets may be submitted by phone or email and are typically dealt with within 4 hours, whilst urgent requests are given higher priority. By using Open Source platforms, ongoing updates and developments are simpler to execute using internal resources or by handing over to third parties if required. Occasionally core security updates and patches are released. Part of the support budget allows for installation and updating the platform to ensure protection from identified vulnerabilities and threats.